This information has been gathered from personal experience and is believed to be accurate but there is no guarantee that this is the case. Anyone using this information does so on the understanding that its use is completely at their own risk and that no liability for errors or omissions or consequential damage to persons or possessions will be accepted by the author or his agents. Prospective users should make their own considered judgement or seek specialist advice as to the accuracy or otherwise of any statements made before using this information in anyway. 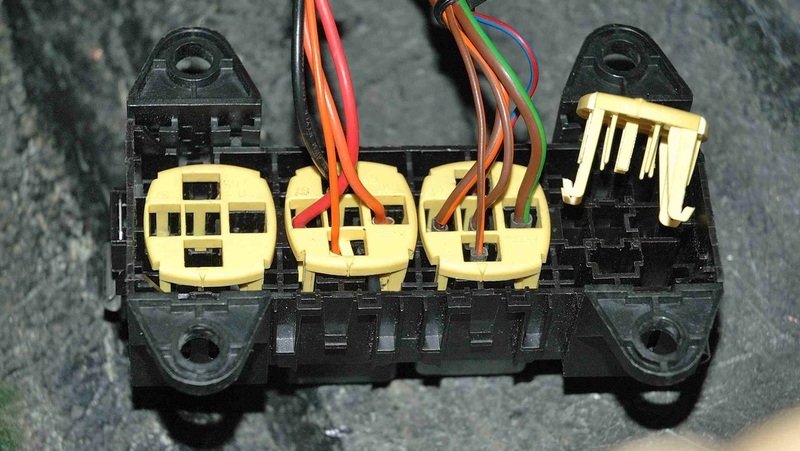 Vehicle wiring can be quite complex so if you are not confident in this area you are strongly advised to find someone competent to carry out any modifications. On the drive back from a successful MOT test the fuel pump suddenly cut out leaving me stranded. I changed both the usual culprits, the ECU and fuel pump relays to no avail so had a tow home. Thinking the fuel pump itself must have packed up I ran a direct feed to the pump and it fired straight away. So started a marathon search for the fault. There are several plug/sockets in the fuel pump circuit together with the pump relay, inertia switch and fuses. Locating the fault involved removing the dash and a considerable amount of grovelling in the passenger footwell. While localising, the fault cleared and would not return so I put it down to a dirty connection that had been disturbed. There had to be a better way to mount the fuse/relay panel, the xmas tree relays hanging off the loom in the footwell and the ECU floating around on the battery box so I decided to try and tidy the whole lot. My 1996 500 has quite a bit of spare loom connected to the fuse /relay panel easily enough to move it to the glove box. 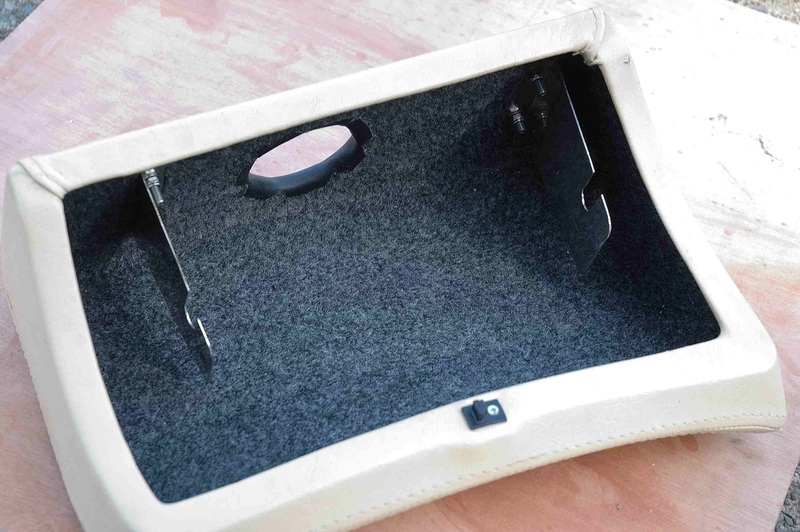 The glove box was initially removed and a hole cut in the back for access and lined with a bit of trim to avoid chafing the loom. 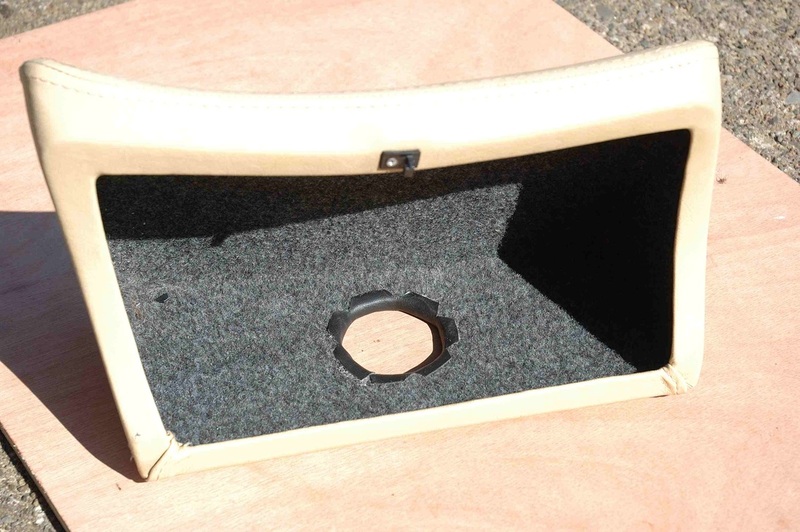 The fuse panel has two mounting lugs that swivel in its original fibre glass housing, the housing was removed and discarded and two new mounts were made out of stainless to fix the panel in the glove box. The loom was disconnected from the fuse panel by carefully removing all the connectors on the base of the panel, its a good idea to sketch the layout before removal to ensure that everything is replaced in its correct position. The loom and its numerous connectors is then carefully fed over the dash support and into the glove box, I removed all insulating tape and plastic protection from the loom to make it more flexible. 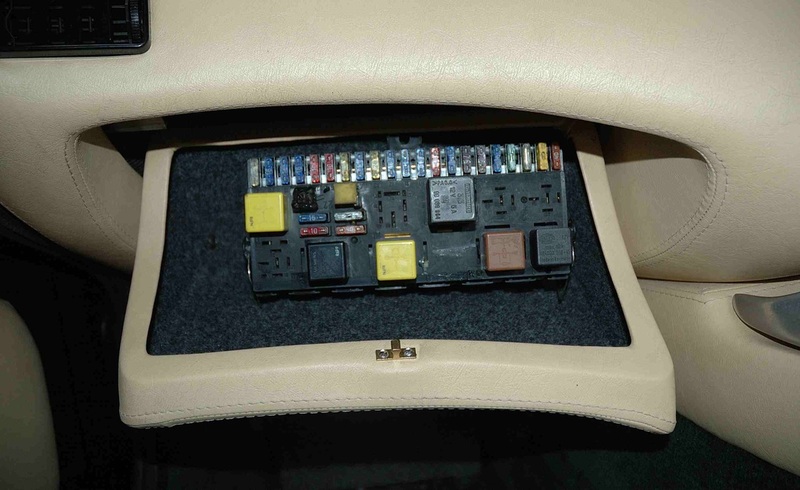 The glove box mounting bolts are re located and the connectors are reconnected to the panel. The loom can then be pulled back through the hole to allow the panel to locate in its new mounting lugs. The panel is quite a snug fit but there is still room for odds and ends in the box. While removing the glove box the inevitable occured as the plastic catch shattered. 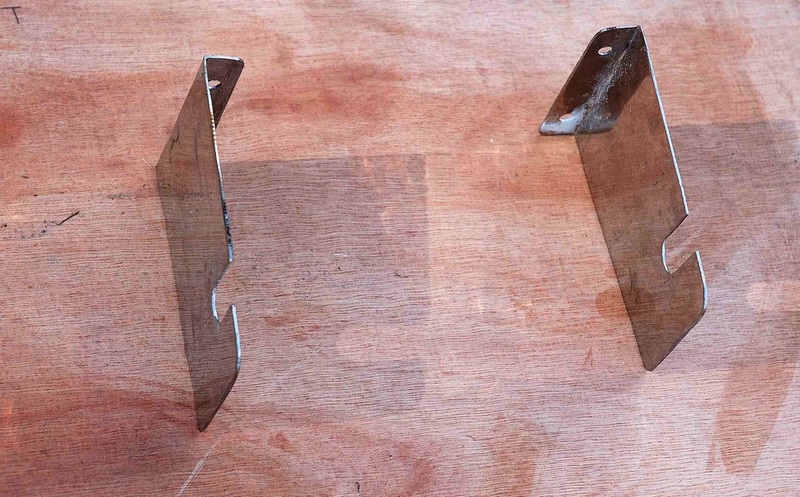 This was replaced by a brass catch obtained from DIY stores that was secured with 6 BA bolts and is a much better solution. The Xmas tree relays hanging off the loom have always annoyed me as has the ECU sliding around on the battery box, Two relay holders are for air conditioning which my car does not have so can be discarded. This still leaves the ECU and fuel pump relays. The "Hot Start mod" also has a relay hanging down. I decided to mount all three on a proper relay holder. 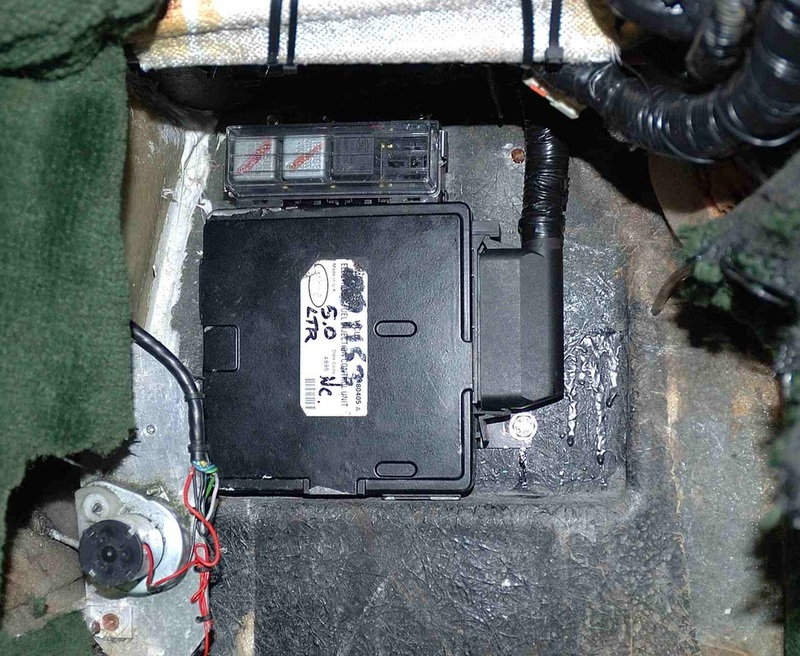 With the fuse panel removed the ECU may now be bolted to the bulkhead with the relay holder mounted above. Many different positions were tried for the ECU and fuse holder but the layout below seemed the optimum as the ECU plug can be removed without unbolting the ECU and relays can be changed with the battery still in position. 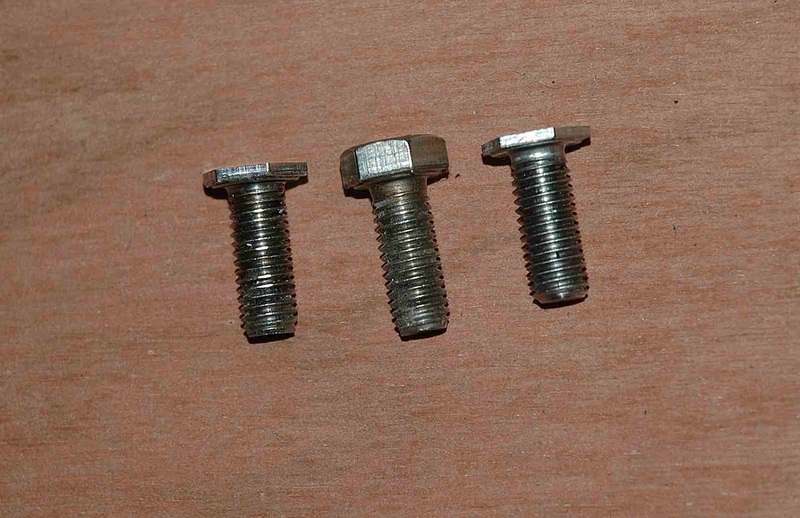 The head of one mounting bolt for the ECU had to be reduced to avoid fouling the plug and likewise two of the four bolts for the relay holder had to be reduced as its mounting feet lay under the ECU, a two minute job in the lathe. As the relay holders two top feet mount on a sloping part of the bulkhead the 45 degree spacers had to be made from a bit of scrap tube to allow the mounting bolts to lay true. The nuts and bolt heads on the wheel side of the bukhead were sealed with black silicon to prevent water ingress. A few words on relay sockets may be helpful to those unaccustomed. And may save you having to re crimp the terminals. 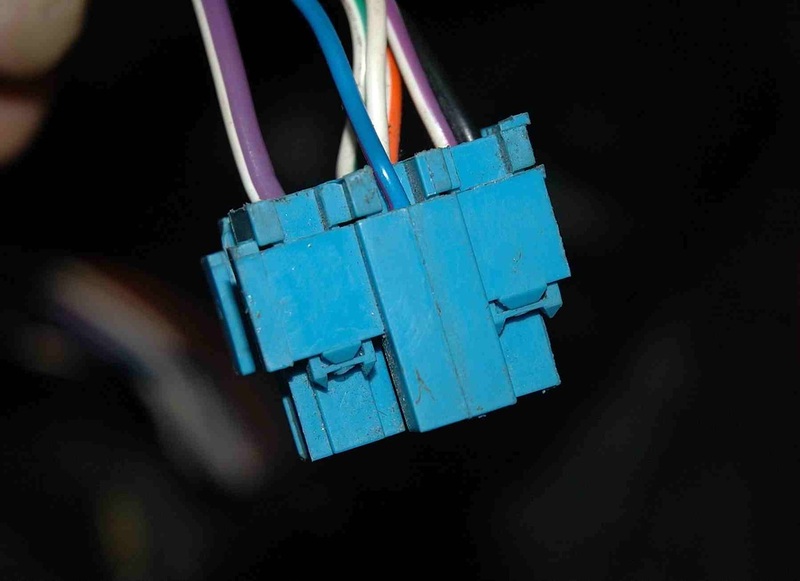 A typical relay socket (blue) is shown above, the terminals are held in by small bent lugs and once located cannot be removed without a special releasing tool. A tool is seen to the right with 6 different shaped prongs to release several types of locking terminals. 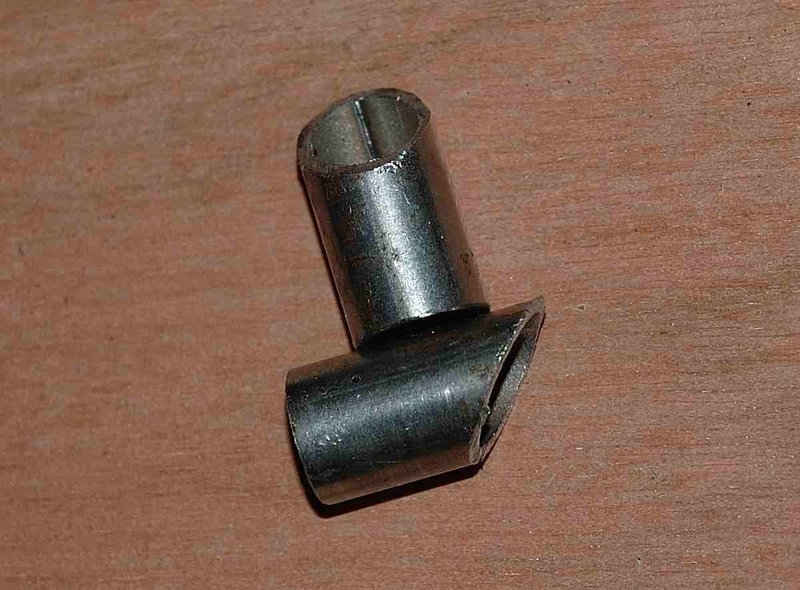 The flat blade prong is used to release relay terminals by inserting the prong through the front of the relay socket thus bending the locating lug out of the way. Additionally, before inserting the release tool the rear of the plastic socket has to be removed as it also locks the terminals in place. At the rear of the blue socket (above) is seen a separate plastic locking piece (usually a pair), one is shown detached and the other partially attached on the black relay socket. 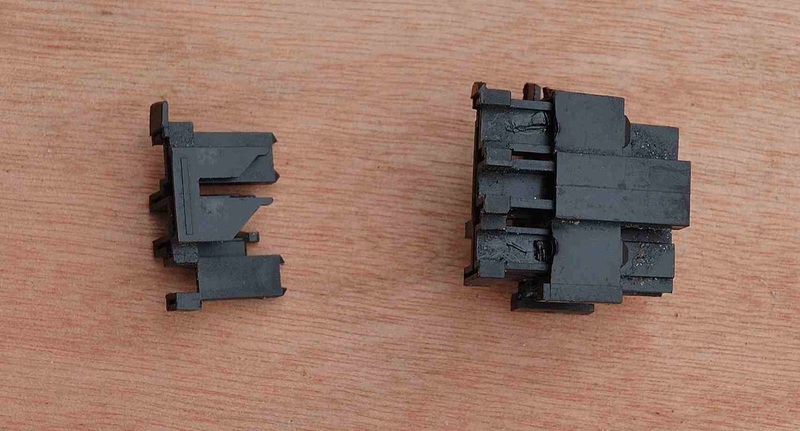 These locking pieces have to be removed before inserting the release tool to remove the terminals. A small screwdriver will ease them out. 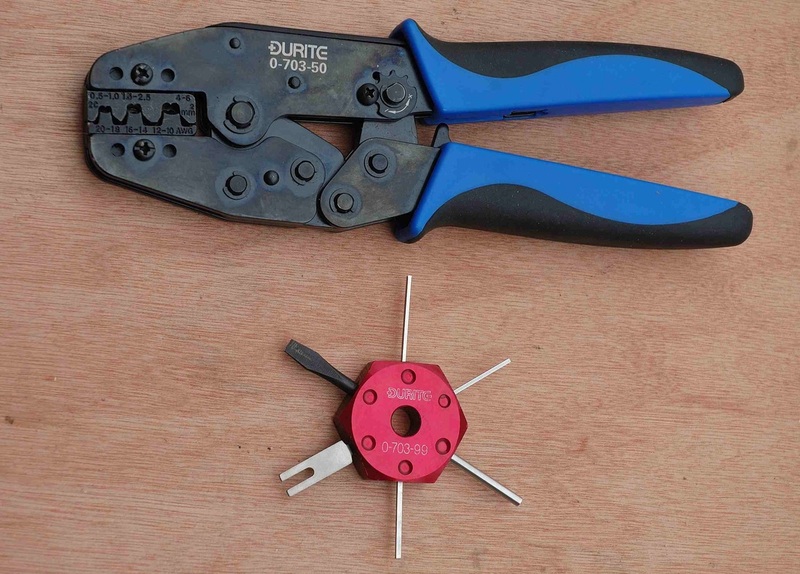 To attach wires to relay terminals a good quality ratchet type crimping tool as shown above makes the job so much easier and produces a reliable joint. Cheap non ratchet crimpers are a waste of time. I had to remake the terminals for the "Hot Start mod" relay but managed with care to transfer the ECU and Fuel pump terminals from the old relay sockets to the new without re-crimping. The four way relay holder I used has a different type of plastic locking piece (yellow) that also has to be removed from the socket to allow the terminals to be inserted, the wires must therefore be passed through the relevant hole of the locking piece before locating the terminals in the socket, this is easier to do than explain. These modifications have removed the mess in the footwell, allowed both ECU and relays to be properly mounted on the bulkhead and placed the fuse/relay panel in a convenient position albeit losing some room in the glove box. Checking fuses is no longer the nightmare it used to be. On my car Fuse 3 is a spare (originally for heated seats). So without heated seats can be used for another circuit. The " Hot start mod" requires its own fuse so it made sense to get rid of the in-line fuse and relocate it here. With reference to the most useful layout details of the fuse/relay panel devised by Dave Spenceley many years ago, fuse 3 (lower) is fed from the ignition relay 5-24 (ignition +ve) which is ideal. Fuse 3 (upper) terminates on block G-30a and the air/con relay 7-34. (relay not present). The connection to block G-30a was cut and the hot start main +ve feed connected to G-30a. I had considered using Relay positions 7 or 8 (air conditioning) for the ECU, Fuel pump or Hot start relays but 7 shares other connections within the panel with other functions so cannot be used and 8 had terminations missing on blocks E and F.